Why would you buy a Trout Live Bottom trailer? Q: What can it carry? Q: Can I carry asphalt and aggregate? A: Yes, very well. Trout River’s conveyor system is designed for the road builder. 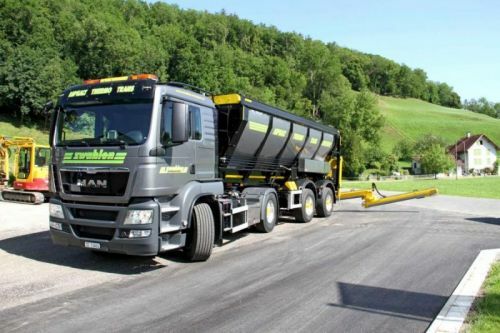 The trailer comes with a standard “reversing valve” that allows operators to bring the load back in- without spilling asphalt on the pavement and keeping the material hot. Trout River’s belt is also rated to minus twenty (-20 Celsius) this means that the trailer can also be used in the winter to transport aggregates or even salt. Q: What makes Trout River better? A: Trout River is a robust trailer that was designed right from the beginning. The trailer gives a balanced load which means that you can maximize your weight over the truck. The tub is bolted to the undercarriage which greatly reduces the stress on the frame. The rounded tub means that there is a lower centre of gravity which is safer going into corners and ramps, an overall lower trailer with greater capacity, less wear on the tub and the material has less of a chance of being stuck in the crossbars. Trout River has the strongest conveyor on the market that is twice as strong as its nearest competitor. The live floor trailers made by Trout River Industries are distributed in Europe by VAKO Transport Systems BV and dealers who are spread over the Netherlands, Sweden, Switzerland, and the United Kingdom. More information you can find on this website.